This week’s guest blog was written by easyfundraiser Samantha Green, Operations Director & Trustee of Dogstar Foundation. “So what drives 2 charity trustees, 2 volunteers and a 7 inch stuffed dog to climb a mountain in Sri Lanka in the middle of the night…? Dogstar Foundation is a small UK Charity that has worked in rural Sri Lanka since 2006, providing free veterinary treatment, sterilisations, and vaccinations to dogs and cats. Currently Dogstar is planning our largest outreach program to date, a 20-day field clinic that will sterlise and rabies vaccinate 500 animals. We need to raise £5000 to finance this vital project and our supporters are assisting us by baking cakes, holding car boot sales and one of our youngest supporters Emily (aged 9) has recently completed a sponsored silence, raising an impressive £30. 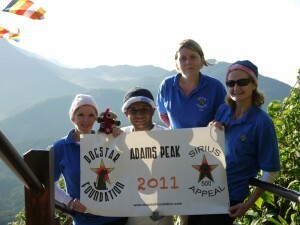 Our team in Sri Lanka really wanted to get behind the fundraising efforts which is why on January 18th, four of us plus our travelling mascot Sirius the dog climbed a mountain over night in the ultimate sponsored walk! Adam’s Peak is a 2,243 metres (7,359 ft) tall conical mountain located in central Sri Lanka. It is well-known for the Sri Pada “sacred footprint”, a 1.8 m rock formation near the summit, in Buddhist tradition held to be the footprint of the Buddha, in Hindu tradition that of Shiva and in Muslim tradition that of Adam. We started the climb early at 1am so we could have plenty of stops to take photos, drink hot sweet tea at the numerous stalls on route and catch our breath. The last 1500 steps where brutal but luckily there is a handrail, which proved very useful, as our legs were rather wobbly at this point. 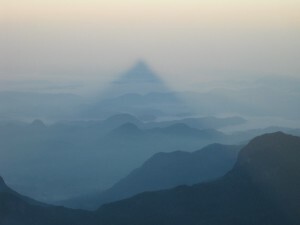 We all reached the summit in time for daybreak and with other pilgrims watched the most amazing sunrise on the eastern side and then the intriguing triangle shadow cast on the western side. Going down was not much easier than climbing up, every single step down jarring our already aching limbs and it seemed a lot longer than the 7km. It took us all a few days to recover but we were all very proud to have made the climb for Dogstar and have raised over £250 so far. You don’ t have to take up moonlight mountaineering to support us, you can donate directly to the Sirius 500 appeal or sign up to support Dogstar Foundation via easyfundraising; it’s a lot easier that climbing 7,359 ft in the dark and your feet won’t ache for days either!